"Excellent tour! Our 10 days included time in Saigon, Hoi An, Hue, Hanoi, Mai Chao,..."
"Amazing tour, perfect balance between adventure, culture, nature and party life in..."
"It was a truly amazing tour, exceeded all expectations - even after reading many..."
"This was the first time we went on a tour, and we were a bit nervous about it. We..."
"The Hanoi to Hoi An itinerary allowed a great mix of touring and relaxation time...."
"We asked for a extra night 31/3 , we didn’t. 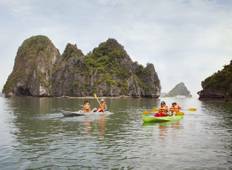 We received a email telling that our..."
"The Vietnam intro was one of the best experiences I've ever had. Jack was the most..."
"This tour was absolutely sensational. Way beyond my expectations in every way! Our..."
"The motor bike tour in Hue." "The trip was exactly what I wanted, A chance to experience Vietnam from grass roots..."
"We visited a lot of sites, so it was always something new and exciting :) The day's..."